In ages past, a tiefling witch sequestered herself within a trap-laden tomb in order to acquire immortality for herself and her daughter. The witch must have failed, for her tomb has been sealed behind a serpent-shaped lock since that day. A clever hero found a way into the tomb centuries ago, but she was never seen again. Now, a key to the tomb has fallen into the hands of her descendant, who commissions the PCs to breach the ancient tomb and recover the hero’s remains. But this is no mere dungeon crawl; the PCs must overcome devious traps, intricate puzzles, a village of wary lizardfolk, and ancient betrayals to unearth a lost legacy. "Beyond the Serpentine Lock" is a wilderness and dungeon adventure for the Pathfinder Roleplaying Game suitable for any campaign world. 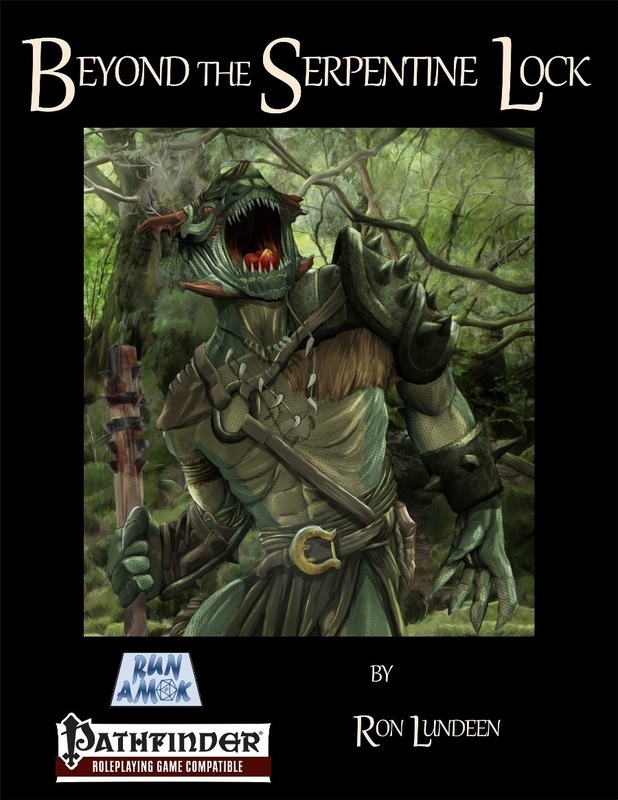 Presented for PCs of 3rd or 4th level, this adventure also includes notes and statistics for scaling challenges to PCs of lower or higher level. The adventure contains several player handouts and a file containing 1 inch scale color maps of the encounter areas ready for printing. "Beyond the Serpentine Lock" is written by Ron Lundeen, with illustrations by Marco Morte and Sandro Rybak and cartography by Marco Morte and Hugo Solis. This module is 53 pages long, 1 page front cover, 1 page editorial, 1 page ToC, 1 page SRD, leaving us with 49 pages of content, so let's take a look! When the hero Amnis vanished, the people mourned - and now one his descendants, the historian Algus, has found the key to the fabled tomb, where Amnis allegedly vanished under mysterious circumstances - enter the PCs! Venturing into the woods, the PCs are soon beset by lizardfolk scouts and soon will realize that a whole village, Tenteeth, is rather near - surprisingly, the scaled humanoids there can be reasoned with and aren't hostile. The settlement is fully depicted and mapped herein and makes for a nice waystation where first ominous rumors on the stone structure in the woods can be gathered. Reaching the place, the PCs will see an indentation, where something obviously was taken - and it's not their key! Returning to the Lizardfolk's enclave, the PCs will, after some short investigation, realize that the shaman's shield might be what they're looking for. To prove themselves worthy, the PCs will have to defeat the tribe's champion, one Gutchewer - a Str 28 Lizardfolk BRUTE. Oh, and dealing with the hamlet by negotiation, stealth or brute force - the module has all the approaches covered. Finally having the serpentine shield, the PCs can try to open the crypt - via a visual puzzle (fully depicted in the handouts) that has the PC drag the snakes extending from the shield in a particular shape according to hints gathered. After using their brains, the PCs will thus finally open the crypt (again, fully mapped)- where a guardian statue awaits: Rather cool here - dealing certain amounts of damage to the statue changes how it handles itself in combat! I wish more creature had such phases. Ghouls from which bloody skeletons burst forth, traps, haunts, attic whisperers and a semi-helpful protean voidworm can fill the PCs in on some details. It seems as if this complex was once the base of a tiefling matriarch who sought lichdom for herself and immortality for her daughter. Zalsiniah, teh failed lich, is still in this tomb and she is essentially a mindless horror - one that might annihilate the PCs - unless they have found her personal icons, each of which weakens the dread undead. It should be noted that beyond the hints of the protean, the implicit storytelling and the ability to trail Amnis' progress adds further depth to the small dungeon. In the failed lich's chamber, the PCs can also find Amnis' by now skeletal remains. Depending on how the PCs have handled the lizardfolk of Tenteeth, they may have an ambush waiting outside - but either way, the module is not over yet: Returning to Algus' home (again, fully mapped), the PCs will have to save the scrivener from the descendants of Amnis' disgraced halfling servant, who ran away, thus dooming the hero. Defeating the halflings and finally bringing to light the treachery of their ancestor, the PCs will hopefully emerge victorious here as well to reap the rewards of being embellished by the scribe into larger than life versions of themselves. The pdf's appendices contain the failed lich template (CR 1+half base creature HD), detailed scaling information for levels 2 and 5-6, 5 pregens (one of which a catfolk paladin, btw.) and the aforementioned village, which comes with full settlement stats for our convenience. The pdf also includes a gorgeous map-pdf that covers 13 pages of full color maps with grids and sans annoying numbers etc. or player-spoilers - AWESOME! Weirdly, though, no player-friendly version of the Lizardfolk village is included. Oh well. Editing and formatting are very good, I didn't notice any significant glitches. Layout adheres to Run Amok Games' elegant two-column b/w-printer-friendly standard and the full color map booklet is awesome. The pdf comes fully bookmarked for your convenience and the amount of handouts is neat to see as well. Ron Lundeen delivers a cool module here, including puzzles, various ways to deal with foes and a creepy dungeon. Add to that the superb cartography and we have a neat module at our hands - handouts,maps etc. - all at top-notch production values. That being said, as well-constructed as the module is, it also feels a bit...less inspired than other Run Amok Games-modules. Make no mistake, the combats (and how A LOT of creatures come with tricks that reward smart fighting), the puzzle etc. - all of these are great. It's just that the overall plot remains a bit stale. Make no mistake, though: this is still fun and a very good module that provides, especially once you run it, some serious entertainment, but it is also a module that will not have your players talk about it for years to come - it's fun, but lacks this touch of being special in its overall structure - its components do have that, though. My final verdict will hence clock in at 5 stars, but sans seal of approval. When does the print version become available? Bug says it can't be delivered. Stops the whole order. Annoying. Not at all sure about the bugs issue, but the print version will be on its way to Paizo in about a week...so available after that (answer hazy due to inevitable holiday shipping delays). Well, I want it. But I hope the issue is resolved soon. First time it happens to me on a preorder. Print/PDF bundles are having an issue with our system's finding shipping prices. We're aware of the issue but do not have an exact ETA for a fix. If you wish to purchase a bundle, make sure its in the shopping cart (with or without other items) and then let customer service know (email, CS forums or phone) and we can let you know the shipping and manually process the order. In general if you have a problem with an order or product please let customer service know via email, messageboards or phone! We don't always see stuff posted in other areas of the site. Reviewed first here on Endzeitgeist.com, then submitted to Nerdtrek and GMS magazine and posted here, on OBS and d20pfsrd.com's shop. Cheers! Thanks for the great review, End!